OK so I've been meaning to do this for a while but I've been mega busy..so sorry I've neglected my blog lately :( but here are some limited edition mac bits that I got and E.L.F stuff...which i must say is fab and at such cheap prices I wouldn't complain anyway..I love the studio line they have in the U.S...apparently its coming to the U.K in the spring yay!!! 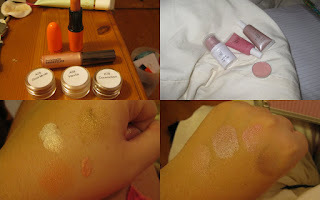 *Pigments in cocomotion and vanilla..I didnt swatch the gold mode as i already have done a swatch in previous posts!!!! these were free gifts from the ebayer..visit their site http://www.love-makeup.co.uk/ they rock they have lots of LE stuff and they don't rip you off!!! *natural false lashes...amazing by the way!! !